Several hundred Fife Flyers fans braved gales and motorway blizzards, only to watch their under-strength team get blown apart at a packed Braehead Arena on Saturday night. Flyers were given a lesson in slick, aggressive hockey by the impressive Elite League leaders, who scored five going on 10 as they pelted Kevin Regan’s goal with 47 shots. The only crumb for the travelling fans to nibble on was a Scott Fleming powerplay goal that prevented a home shut-out little more than a minute from full-time. By then though, several dozen Flyers fans were already well into their journey home having given up after two periods of one-sided hockey. Injury and suspension meant Flyers were up against it even before face-off. 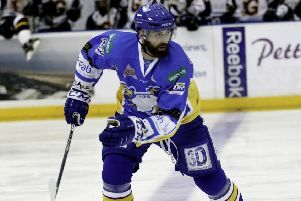 Kyle Horne and Matt Nickerson’s absence left the defence lacking in both depth and physical presence, while Chris Auger’s injury continues to be felt through the side. You may expect a lack of depth to catch up with the side in the latter stages of the game, so there could be little excuse for Flyers woeful start to the match. They conceded the opener after just 38 seconds - Lee Salters pouncing on a mistake by Jamie Milam to finish in style - and before 13 minutes were up Flyers were 3-0 down. Derek Roehl had the complete freedom of the left wing to collect a pass and pick his spot past Regan on 5.01, before weak defending at the crease allowed Salters to bully the puck over the line on 12.48. With his team capitulating, Flyers coach Todd Dutiaume called a time out, and Flyers managed to steady the ship until the first intermission. The visitors then ran into penalty trouble at the start of period two, which ironically was well defended, only for Clan to extend their lead once the teams were evened up. Ben Davies arrived at the perfect moment to deflect Lee Esders effort past Regan for 4-0 on 29.52 - and the Fife goaltender’s complaints that the Clan skater had kicked the puck past him fell on deaf ears. Flyers were rarely seen as an attacking force, shots from wide angles were about as good as they could manage, and the concession of a short-handed goal on 48.54 really summed up the performance. Bobby Chaumont lost the puck cheaply in the Clan zone and the hosts broke forward - Matt Keith rattling the bar before Salters gobbled up the rebound. Flyers were in disarray. Period three was all about damage limitation for Fife - don’t concede any more and try to at least give their fans a goal to cheer. Flyers managed it - restoring a little pride by winning the third period - although that looked unlikely until Tristan Harper’s 2+2 penalty with just over four minutes left gave Flyers an extended powerplay. Kyle Jones made a couple of stunning saves as he fought to maintain his shut-out but that was broken on 58.51 as the hard-working Fleming - one of only a few Fife players to put in anything like the required performance - pounced on his own rebound off the backboards to net from a tight angle. The result left Flyers 11 points behind Clan in the Gardiner Conference - albeit with two games in hand - while wins for Coventry and Hull puts pressure on Flyers in the overall Elite League standings. Flyers coach Dutiaume admitted his team lacked fight, and even suggested they were playing scared without their enforcer Nickerson, who returns against Edinburgh Capitals tonight (Sunday). “We knew it was going to be a difficult game coming in,” he said. “We’re well aware of the injuries and suspensions we’re carrying right now, but that’s not making any excuses. “We had prepared the guys for a tough five minutes at the start of the game, but we thought if we could get through those five minutes anything could happen. “But it was very disappointing to let them score early and it was really us chasing the hockey game after that. “It sucked the life out of our legs and we seen guys heads go down. It didn’t seem like we had a lot of fight in us and that’s a little disappointing. “Guys have got to remember that can lose a hockey game, but there’s got to be a pride factor. You’ve got to come out and protect your goaltender and guys who are maybe hurting a little bit, but we just didn’t have that fight. “Our defence core are pretty banged up but I think it was mostly our back checking wingers or high guy - we just didn’t have that jump and Braehead looked like they had legs to go all night. “Hopefully we have addressed it because we talked to those guys - everybody bar us got points tonight and moved up the standings. “It’s vital that these guys find a way to bounce back against this Edinburgh. We get Matt (Nickerson) back - and we’re a different team with him in lind up. “Whether it’s the physical presence - and I can’t believe I’m saying this - but guys are playing scared at some points. “This is the second year in for the majority of this club - and we’ve seen both ends of the spectrum. We’ve seen them ride lows and we’ve also seen what they’re capable of.